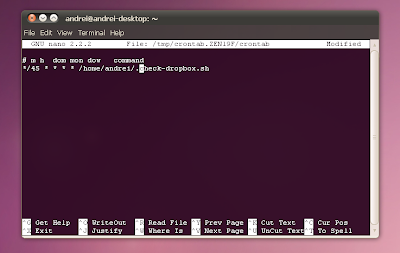 jarlath @ Ubuntuforums has created a nice Dropbox script which closes Dropbox after the synchronization finishes. the Dropbox icon doesn't match the new monochrome icons in Ubuntu anyway, and the Dropbox notification area cannot be changed (in the stable version because the experimental version has this. New post coming in a few minutes). If you want to use the script here's what you need to do. Note: the filename begins with a "." which means the file will be hidden so it doesn't clutter your home folder. 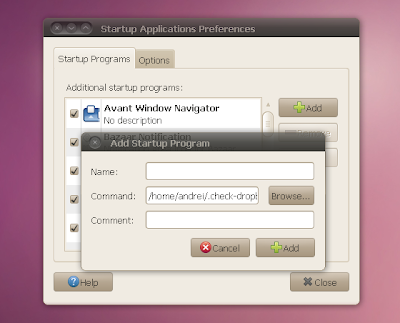 The script can also be downloaded from the Ubuntuforums. To add the script to your startup applications, go to System > Preferences > Startup Applications, click "Add" and add the script (remember, it's called .check-dropbox.sh). If you saved it to your home folder, browse for it, click Ctrl + H to show hidden files and select .check-dropbox.sh, then give it a name and that's it.